My players are all opium addicts. The whole plot of the campaign is just them doing crimes to get more opium. There's already a table in the book for what happens when you smoke opium, but I wanted the effects to have a larger game impact and be more likely to be bad. Hence this. Probably a few ways you could use it. Jittery. Your nerves are on fire and everything makes you flinch. +2 dodge bonus to AC. Lethargic. You can’t keep your eyes open and everything seems to move in slow motion. -2 AC. Furious. You are filled with a terrible hatred of all living things. +2 to attack rolls. Peaceful. You are filled with a great love for all living things. -2 to attack rolls. Alert. You can see every detail of everything. +1 to critical hit range. Vague. The world is a blur to you. +1 to fumble range. Dulled pain reception. You can’t feel anything. 1d8 temp hit points, lost when opium wears off. Heightened pain reception. You feel everything, way too much. Take +1 damage from all attacks. Competent. You feel like you can do anything. +2 to all skill checks. Forgetful. You can’t remember how anything works. -2 to all skill checks. Mildly precognitive. Always go first in combat. Melancholy. Don’t care if you live or die. Always go last in combat. Paranoid. They’re all out to get you. You can’t be ambushed or taken by surprise. Echolalia. You can’t stay silent unless gagged. Friendly. Everyone is great. People you meet for the first time will like you and want to do favours for you. Dry mouth. You need to drink something every fifteen minutes or you stop being able to talk. You can understand all languages and can make a Wisdom save to determine if someone is lying. You forget how to read and automatically believe anything you’re told unless you make a Wisdom save. Gold smells like cinnamon to you. You will always know if there’s any in the vicinity, unless it’s actual cinnamon. Your digestive system rebels against you. Take 1d6 damage from gut cramp whenever you eat. You gain an unseen servant, as per the spell, that can’t attack but otherwise does your bidding. Whenever you take damage, make a Wisdom save or be paralysed with laughter for one round. Fire doesn’t hurt you, but tickles immensely. Pure water burns you like acid. You can see, and speak to, the ghost of anyone who has died in the last day. All animals that see you feel compelled to harass you. Your features flow like liquid. Once an hour you can make a Wisdom save to look like anyone you want to look like. You must be outside, breathing the fresh air. You can’t stay in any enclosed space unless you make a Wisdom save. You enter a creative trance and write an excellent poem, which can be sold to a journal or traded to a noble for a favour. Music sounds so beautiful to you that you are immobilised with delight so long as you can hear anyone playing it, unless you make a Wisdom save. A vision shows you victory. Can be cashed in by player to critically succeed on any roll. A vision shows you defeat. Can be cashed in by DM to make player critically fail any roll. A demon comes to you in a vision and offers you a bargain. You blunder into the dream-realm of a minor deity and are now obliged to placate it. A vision shows you a dangerous place where treasure is hidden. You dream of thieves and awake to find d100 gp missing from your purse. A vision resolves something that’s been bothering you. You can ask the DM a question and they will give you a helpful answer. You are now addicted to opium. Whenever you rest, if you didn’t smoke any opium that day, roll on the withdrawal table. Can’t regain HP until the next time you smoke opium. If you already have this, take 1d6 damage. -4 to random stat until the next time you smoke opium. Roll on the bad effects table. 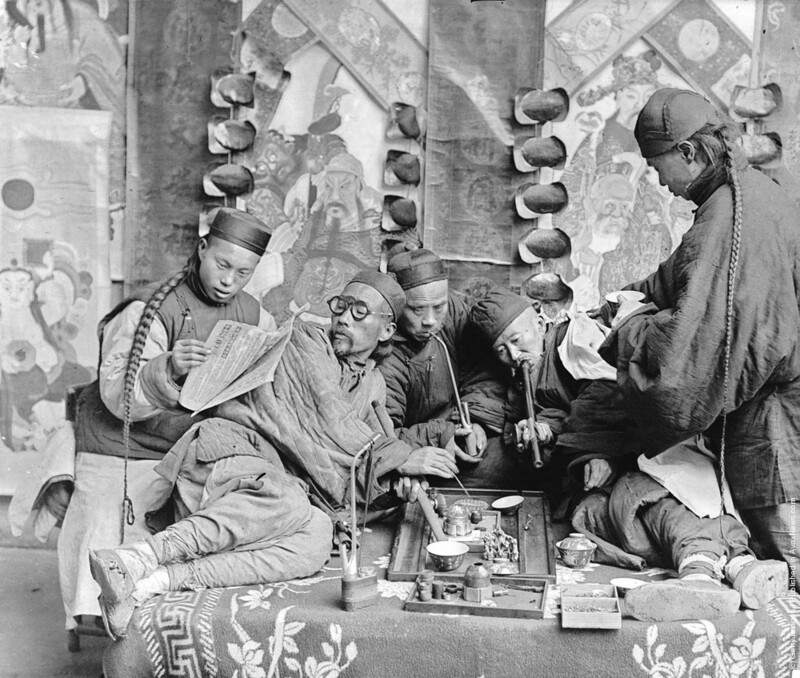 Effect lasts until the next time you smoke opium. Monkey demon follows you around harassing you until the next time you smoke opium. You are no longer addicted to opium. One of the players in my Yoon-Suin campaign got addicted to opium and was so scared off it (they mostly had stimulant laced stuff so they were unable to take long rests) he went through the recovery rules and then he eventually built a druid methadone healing garden in the Yellow City. In 27 years of running D&D games I'm pretty sure it's the only piece of non-adventuring infrastructure PCs have ever built in my games.